Saint Helena, named after Saint Helena of Constantinople since it was sighted on her feast day, is an island of volcanic origin in the South Atlantic Ocean. A British overseas territory, it consists of the island of Saint Helena, as well as the dependencies of Ascension Island and Tristan da Cunha, also of volcanic origin. Ascension is named after the day of its recorded discovery, Ascension Day. Tristan da Cunha, the most remote inhabited island in the world, was named for himself by the sailor who first saw it. From about 1600 the island was well known by captains from Portugal, England, France, and the Netherlands. The island was used for collecting food and as a rendezvous point for homebound voyages from Asia. Saint Helena is one of the most isolated places in the world, located more than 1,200 miles (2,000 km) from the nearest major landmass. As there is currently no airport on Saint Helena, travel to the island is by ship only. The RMS Saint Helena berths in James Bay approximately 30 times per year. The British government announced plans to construct an airport in Saint Helena in 2005, which is expected to be completed by 2010. Map of the island of St. Helena. The island of Saint Helena, 10.5 miles (17 km) long and 6.5 miles (10 km) wide, has rugged, volcanic terrain. Its area is 47 square miles (122 sq km). There are several rocks and islets off the coast, including Castle Rock, Speery Island, The Needle, Lower Black Rock, Upper Black Rock (South), Bird Island (southwest), Black Rock, Thompson's Valley Island, Peaked Island, Egg Island, Lady's Chair, Lighter Rock (West), Long Ledge (Northwest), Shore Island, George Island, Rough Rock Island, Flat Rock (East), The Buoys, Sandy Bay Island, The Chimney, White Bird Island and Frightus Rock (southeast), all of which are within one kilometer of the shore. The center of Saint Helena is covered by forest, some of which has been replanted, including the new Millennium Forest Project. The highlands are two to three degrees cooler and get a few more inches of rainfall annually than the rest of the island. They are more tropical in nature and contain most of the island's endemic flora, fauna, insects, and birds. The coastal areas are barren, covered in volcanic rock, and warmer and drier than the center of the island. At the time of its discovery, the island was covered with indigenous vegetation, including the remarkable cabbage tree species. The flora of Saint Helena contain a high proportion of endemic species. The island's interior must have once been a dense subtropical forest, but the coastal areas were probably quite green as well. The modern landscape is very different, with a lot of naked rock in the lower areas and an interior that owes its lushness to imported vegetation. The dramatic change in landscape can likely be attributed to the introduction of goats and new vegetation. 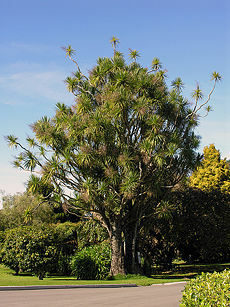 As a result, the string tree (Acalypha rubrinervis) and the St. Helena olive (Nesiota elliptica) are now extinct, and many of the other endemic plants are threatened with extinction. Map of Saint Helena, Ascension Island and Tristan da Cunha. Ascension Island includes the main island and several uninhabited tiny satellite islands and rocks such as Boatswain Bird Island, Boatswain Bird Rock (east), White Rocks (south), and Tartar Rock. The main island has an area of approximately 35 square miles and is formed by volcanic peaks rising from just west of the mid-Atlantic Ridge. Most of the island is a moonscape of rugged black lava flows and red wind-whipped cinder cones. Where lava has penetrated to the ocean a striking seashore is dotted with white sand. The protected green turtle is perhaps the most notable of the wildlife, coming ashore to lay eggs on the beaches from November to May. The climate is subtropical, with temperatures at the coast ranging from about 68 to 88 degrees Fahrenheit (20 to 31 degrees Celsius). Offshore, there is a variety of open-ocean fish, including sharks, wahoo, tuna, bonito, barracuda, marlin, blackfish, and sailfish. Off the east coast of Ascension is the tiny island of Boatswain Bird Island. It is a haven for sea birds, to get away from the rats, cats, and people that came to Ascension Island from Europe and Africa. Following a successful campaign to rid the island of feral cats, sea birds are once again nesting on Ascension itself. 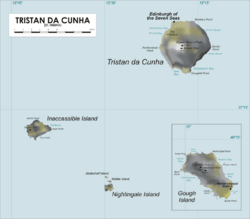 Tristan da Cunha includes the main Tristan da Cunha Island — the world's most remote inhabited island — and several other uninhabited islands: Gough Island, Inaccessible Island, and the three Nightingale Islands. The islands are all mountainous and volcanic. Inaccessible Island and the Nightingale Islands are located 22 miles (35 km) southwest of the main island, while Gough Island is located 245 miles (395 km) south-southeast. The main island is quite mountainous; the only flat area is the location of the capital, Edinburgh, on the northwestern coast. The highest point is a volcano called Queen Mary's Peak (6,765 ft; 2,062 m). It is covered by snow in winter. The climate is marine subtropical with small temperature differences between summer and winter and between day and night. Tristan da Cunha is the nesting place of three species of Albatrosses: the Atlantic Yellow-nosed, the Sooty, and the endangered Tristan. Northern Rockhopper penguins also have their rookeries on the islands. Other sea birds are shearwaters, petrels, skuas, and terns. St. Helena is a volcanic island, although volcanic activity has long since ceased. The last volcanic eruptions occurred about seven million years ago, and since that time the island has been sculpted into its present form by the forces of erosion. The sea has carved the sheer cliffs that ring the island and streams have incised the deep v-shaped valleys. The oldest volcanic rocks on Saint Helena are about fourteen million years old and are exposed in the northeastern part of the island. About eleven million years ago, the center of volcanic activity jumped to the southwestern part of the island, where activity persisted until seven million years ago. Most of the eruptions produced the basalt lava flows so evident in the cliffs and valley sides of the island today. Ascension's main island is a volcanic peak rising from just west of the Mid-Atlantic Ridge. Much of the island is a wasteland of lava flows and cinder cones; 44 distinct craters have been identified. Tristan da Cunha is also of volcanic origin. In 1961, a volcanic eruption forced the temporary evacuation of the entire population. 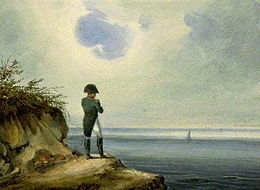 Napoleon in exile on Saint Helena. The island of Saint Helena was discovered on May 21, 1502, by the Portuguese navigator João da Nova and named after Helena of Constantinople. The Portuguese found it uninhabited and over time built a chapel and some houses, although no permanent settlement was founded. The Portuguese introduced goats as a source of meat and planted lemon trees for future ship crews, a number of whom were left on the island to recover from scurvy and other ailments. From about 1600 the island was well known by captains from Portugal, England, France, and the Netherlands. The island was used for collecting food and as a rendezvous point for homebound voyages from Asia. Sometimes ships waited near the island when their captains were hoping to pirate hostile richly laden ships. The Dutch claimed the island between 1645 and 1659, when it was settled by the English East India Company. A permanent settlement — of British colonists and black slaves — was founded at Jamestown, named after James, Duke of York (later King James II). The English East India Company used the island as a revictualling station, primarily on the long return voyage from India via the Cape of Good Hope. By 1673 nearly half the inhabitants were imported slaves, but between 1826 and 1836 all slaves were freed. The Dutch retook the island in 1673 but were ejected by the English navy after two months. The island was regranted to the East India Company. During this period the island was strongly garrisoned. The British also took control of Ascension Island and Tristan da Cunha at this time, to prevent any French attempts to free Napoleon being launched from these territories. After Napoleon's death the East India Company resumed full control of Saint Helena until April 22, 1834, when it was vested in the British Crown. In 1810, the first Chinese indentured laborers arrived on the island. In 1840, a Vice Admiralty Court was set up to deal with vessels captured in the slave trade, and more than ten thousand slaves were liberated. During the Second Boer War (1899–1902), the British military, fearing that Boer prisoners of war might be freed by sympathizers in South Africa, detained around 5,000 POWs on the island. As a port of call on the long route to the Cape Colonies and India, the island enjoyed prosperity, until construction of the Suez Canal reduced the need for long voyages via the Cape of Good Hope. During World War II, Ascension Island was leased to the United States, which constructed a large airbase. After World War II, the prosperity of the island and its dependencies decreased. A visit by the Duke of Edinburgh to Ascension, Saint Helena, and Tristan da Cunha for a time raised the profile of the islands. In 1999, the British government announced plans to construct an airport on Saint Helena to bolster the island's economy and reduce dependence on boats for supplies. The airport is scheduled to open in 2010, when the Royal Mail ship is expected to cease operations. Ascension Island became inhabited in 1815, when the British garrisoned it as a precaution after imprisoning Napoleon Bonaparte on Saint Helena to the southeast. The location of the island made it a useful stopping point for ships and communications. The Royal Navy used the island as a victualling station for ships, particularly those working against the slave trade. A garrison of Royal Marines was based at Ascension from 1923. In 1922, Ascension was made a dependency of Saint Helena. In 1964, the British government appointed an administrator to represent the governor of Saint Helena on Ascension. During World War II, the United States built an airbase on Ascension Island, known as Wideawake after a nearby colony of Sooty Terns (locally called 'Wideawake' birds because of their loud, distinctive call, which would wake people early in the morning). The airbase was used by the U.S. military as a stopping point for American aircraft crossing the Atlantic on the way to theaters of operation in Europe and Africa. After the end of World War II, the airbase fell into disuse. With the space race and the Cold War, Americans returned in 1956. Wideawake Airfield was expanded in the mid 1960s. The runway was extended, widened, and improved to allow its use by large aircraft, and acts as an emergency runway for the Space Shuttle. Ascension Island continues to serve as an important link in American space projects. NASA established a tracking station on the island in 1967 but has since abandoned it. In 1982, Ascension Island was used as a staging post for the British Task Force during the Falklands War. Following the war, the British retained an increased presence on the island. 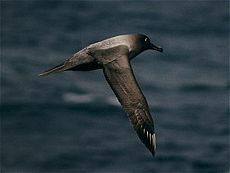 Light-mantled Sooty Albatrosses regularly dive in order to feed and can dive to below 12 m.
The islands were first sighted in 1506 by a Portuguese sailor, who named the main island after himself. The main island was ignored by early explorers as a possible home due to its rugged mountain landscape, absence of natural harbor, lack of land for agriculture, and a harsh climate with heavy rain and high winds during all seasons. In 1815 the United Kingdom annexed the islands, ruling them from the Cape Colony in South Africa. This is reported to have primarily been a measure to ensure that the French would not be able to use the islands as a base for a rescue operation to free Napoleon Bonaparte from his prison on Saint Helena. The occupation also prevented the United States from using Tristan as a base, as it had during the War of 1812. The islands were occupied by a British military garrison, and a civilian population was gradually built up. Whalers also used the islands as a base for operations in the Southern Atlantic. However, the opening of the Suez Canal in 1869, together with the move from sailing ships to coal-fired steam ships, saw the increased isolation of the islands, as they were no longer needed as a stopping port for journeys from Europe to the Far East. In 1938, the islands were declared a dependency of St Helena. An administrator was appointed to represent the governor. The administrator acts as the local head of government and takes advice from the Island Council, made up of eight elected and three appointed members. During World War II the islands were used as a Royal Navy station, established to monitor German shipping movements in the South Atlantic. In 1961, a volcanic eruption forced the evacuation of the entire population. In 1962, a Royal Society expedition went to the island to assess the damage, reporting that the settlement had only been marginally affected. Most families returned in 1963. Executive authority in Saint Helena is invested in Queen Elizabeth II and is exercised on her behalf by the governor, who is appointed by the Queen on the advice of the British government. Defense and foreign affairs remain the responsibility of the United Kingdom. There are fifteen seats on the Legislative Council, a unicameral legislature. Twelve of the fifteen members are elected in elections held every four years. The other three members are the governor and two ex officio officers. The Executive Council consists of the governor, two ex officio officers, and six elected members of the Legislative Council appointed by the governor. There is no elected chief minister, and the governor acts as the head of government. Until 1966, St. Helena had a monocrop economy based on the cultivation and processing of New Zealand flax for rope and string. St Helena's economy is now very weak, and the island is almost entirely sustained by aid from London. There are no minerals and most of the land is unsuitable for farming, except on a small scale. Potatoes, Corn, and green vegetables are raised for personal use, as are a few cattle, sheep, goats and pigs. Some make their living from fishing. Tuna, marlin, and barracuda are found in the waters offshore. Saint Helena also produces and exports a unique coffee bean, grown from plants that directly descend from the original seeds brought to the island from Yemen in 1733. The Saint Helena tourist industry is heavily based around its promotion as the site of Napoleon's imprisonment. An 18-hole golf course also exists, and the possibility for sport fishing is great. 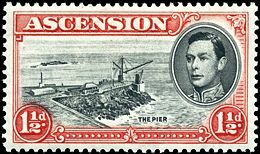 Ascension Island, Tristan da Cunha, and Saint Helena all issue their own postage stamps, which provide a significant income. View of "The Pier," 1938. Saint Helena also produces and exports Tungi Spirit, made from the fruit of the prickly or cactus pears, Opuntia vulgaris. Tungi is the local name for the prickly or cactus pear. The Saint Helenian pound, the local currency, is on a par with the Pound Sterling. The government of Saint Helena produces its own coinage and banknotes. The first coin was a half penny produced by the East India Company in 1821. It remains readily available to collectors. The territory has its own bank, the Bank of St. Helena, which has two branches: in Jamestown on Saint Helena and Georgetown, Ascension Island. The main economic activity on Ascension island is centered around the military bases at Wideawake Airfield. The island also hosts many communications and relay stations, exploiting its strategic position in the middle of the Atlantic Ocean. The European Space Agency (ESA) also has a tracking station, which tracks the Ariane 5 space rockets shortly after they take off from French Guiana. The main source of foreign income for Tristan da Cunha is the lobster factory and the sale of stamps and coins to overseas collectors. Most people have dual occupations, often working for the local government. Many inhabitants have plots of land on which they grow potatoes. Jamestown, the capital of Saint Helena. Saint Helena has a small population of approximately 2,000 inhabitants, mainly descended from people from West and Southern Africa, the British Isles, Scandinavia and China, (via the indentured servants who were brought in). The island's population is one-half African, one-quarter Chinese, and one-quarter white. In recent decades, many have migrated to the Falkland Islands or the United Kingdom. The citizens of Saint Helena and its dependencies hold British Overseas Territories citizenship. On May 21, 2002, they were granted access to full British citizenship. According to statistics in the 2007 Yearbook of Jehovah's Witnesses, Saint Helena has the largest proportion of Jehovah's Witnesses of any country or territory in the world: one person in thirty (129 people). Tristan da Cunha has a population of fewer than three hundred inhabitants, most of British descent. Christianity is the main religion, with the largest denominations being Anglican and Roman Catholic. Its remote location makes transport to the outside world difficult. There is no airport, and the islands can only be reached by boat. Fishing boats from South Africa regularly service the islands. Young people often move abroad to find a spouse, since there are only eighty families on the island. Serious injury can mean sending signals to passing fishing vessels so that the person can be transferred to Cape Town. Television did not arrive on the island until 2001, and the sole channel available is from the Falkland Islands. Tristan da Cunha's isolation has led to an unusual, patois-like dialect of English being spoken. There is no indigenous population on Ascension, although around 1,100 people lived there as of 2005. The military and civilian contractors of the United States and the United Kingdom, along with citizen workers imported from Saint Helena, make up the bulk of the population. Other residents include some British government employees, including the island's British administrator. Employment is a requirement to stay on the island. There are five settlements, the capital being Georgetown. Weaver, Barry. St. Helena: South Atlantic Ocean Geology & Geophysics, University of Oklahoma. Retrieved September 29, 2007. Encyclopædia Britannica. 2007. Saint Helena; The economy Encyclopædia Britannica Online. Retrieved October 3, 2007. This page was last modified on 6 August 2015, at 20:44.